An average family questions their own identity when they are terrorized by a dangerous mob of murderous doppelgangers. While alone on the beach, Adelaide enters a funhouse where she becomes lost in a maze of mirrors. To her shock, Adelaide encounters an exact doppelganger of herself named Red. Adelaide seemingly returns to her parents, but remains temporarily mute and unwilling to recall what happened to her in the funhouse. Present Day – Adelaide and her husband Gabe go to their summer home in Santa Cruz for a vacation with their teenage daughter Zora and younger son Jason. Although apprehensive about returning to the same place where her childhood trauma occurred, Adelaide agrees to go to the beach with her family. As the Wilsons pull into the boardwalk parking lot, Adelaide sees a dead older man with a “Jeremiah 11:11” sign being wheeled into an ambulance. The Wilsons spend the afternoon on the beach with their wealthy friends Josh and Kitty Tyler and their twin daughters Becca and Lindsey. While alone, Jason spies an entranced man in a red jumpsuit and tattered coat standing with his bloodied hands outstretched. Back at home, Adelaide notices that the score of a baseball game on TV is 11-11. Jason points out when the time on a clock reads 11:11. Adelaide also sees that Jason drew a picture of the man he saw on the beach with a glove on his right hand. Adelaide tells Gabe about encountering her doppelganger Red when she was a girl. Adelaide explains that she has been noticing an increase in coincidences and fears that Red is coming for her. Wearing a red jumpsuit and a leather glove on her right hand, Red appears in the driveway with her husband Abraham, deranged daughter Umbrae, and feral son Pluto, all of whom are exact doppelgangers of the Wilsons. The doppelgangers infiltrate the house and take the Wilsons captive. Abraham drags Gabe outside to physically assault him. The two men fight on Gabe’s new boat until Gabe finally kills Abraham using the boat’s motor. Umbrae chases Zora away from the house. Zora manages to escape when Umbrae stops to murder a curious neighbor. Jason discovers that Pluto wears a mask to hide a face disfigured by fire and also mimics Jason’s movements. Jason uses Pluto’s mirrored movements to trap Pluto in a closet. Adelaide breaks free from her handcuffs when Red goes to free Pluto from the closet. Adelaide and Jason flee from the house, regroup with Zora, and ride away with Gabe in his boat. Josh, Kitty, and their daughters are murdered in their home by their doppelgangers Tex, Dahlia, Io, and Nix. Looking for help, the Wilsons arrive at the Tyler house and eventually kill all of the Tyler doppelgangers following protracted physical fights. A news bulletin on television reports that doppelgangers wearing red jumpsuits are coming from underground and using golden scissors to kill people all over America. “The Tethered” begin joining hands in a countrywide human chain. The Wilsons drive away in Josh and Kitty’s SUV. Umbrae attacks the vehicle, but is launched into a tree and dies when Zora brakes suddenly. Driving past numerous dead bodies in the streets, the Wilsons return to the Santa Cruz boardwalk to find Pluto torching their station wagon. Recognizing that Pluto lured them into a trap to torch their SUV too, Jason uses mirror movements to trick Pluto into backing into the fire and immolating himself. However, Red kidnaps Jason. While searching for her son, Adelaide sees entranced doppelgangers continuing to form a human chain in the ocean. Adelaide enters the funhouse where she finds a secret passage leading to a hidden underground chamber littered with live rabbits. Meanwhile, Gabe and Zora recuperate in an ambulance while staying away from The Tethered. Adelaide confronts Red in the subterranean “Underpass.” Red explains that the doppelgangers were created by a government experiment to control the humans above ground like puppets. When the project failed, the clones were abandoned underground until they went mad after generations of living on their own. Enlightened by her encounter with Adelaide in 1986, Red became The Tethered’s leader and organized them to revolt using Hands Across America as a symbol to make a statement. After battling each other with ballet movements from their collective past as a dancer, Adelaide finally kills Red. Adelaide frees Jason from a locker and returns to the surface where they reunite with Gabe and Zora. While driving away in the ambulance, Adelaide reflects on her encounter with Red in 1986. An extended flashback reveals that Red actually took Adelaide’s place while the real Adelaide was forced to become one of The Tethered. Jason looks at his mother suspiciously. Adelaide/Red smiles. The Tethered are shown holding hands across the country. The idea of reviewing “Us” daunted me at first. Between its SXSW debut and wide release two weeks later, the movie didn’t just dominate the box office. It dominated the collective popular culture conversation. 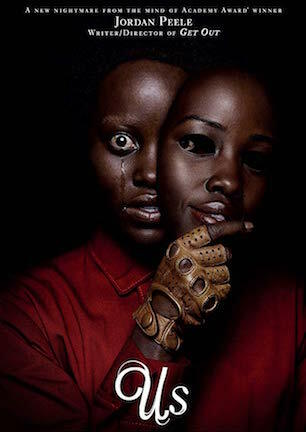 Given the zeitgeist fixture of his freshman feature “Get Out” (review here), anything with Jordan Peele’s name attached automatically attracts attention equal to the quadruple threat’s artistry. From mainstream pundits to niche websites, everyone dove deep into the story, subtext, impact, and more surrounding “Us.” Their insights, both authentic and imaginary, placed “Us” on a pedestal to be praised for meaningful messaging cleverly woven into the fabric of B-movie entertainment. Thousand-word thinkpieces dissected details from diverse perspectives. More erudite editorials mused over metaphors about manifest destiny and privilege-induced suppression while less heady fan theories assigned nuance to recurring Black Flag t-shirts and the number 11. Others posited possible parallels with Norwegian folklore, or connected dots between Jason’s toy ambulance used as a doorstop and the real thing used as a refuge during the finale. I worried, would I have anything worthy to add? I know that the color red signifies liberation from slavery in Umoja Karamu. But I lack the personal experience necessary to completely connect to arcs involving black identity. Would it be irresponsible to even try cracking the code of racial components, or to risk being flip in response to something so emotionally important for others? Essentially, was I educated enough to comprehend the scope of “Us” in its intellectual entirety? As I watched the movie, my anxiety over whether or not my own words on the film would be wise enough subsided. Where some saw symbolism, I saw only nerdy nods to throwback horror. A silent laugh emerged as it occurred to me that perhaps the issue wasn’t me not being up to the dare of digging under unending layers of “Us.” Perhaps chin-strokers were merely overthinking every element of the movie. Maybe Jordan Peele consciously intended to address some of the theories conjured by “ending explained” essays in the movie’s wake. Maybe he meant to do so unconsciously. Maybe he had no such intentions at all. Maybe Jason wears a “Jaws” t-shirt just because it’s funny to see a kid evoke that imagery on a beach. With so many “Us” articles already out there, I don’t have to peel back past the surface. Copious critics and columnists have more than fulfilled that duty. Instead, my purpose is to provide assurance that if you don’t see any of the meta-commentary, or choose not to, you’re not alone in thinking that “Us” is just “okay” as a horror film. Because that is a wholly valid way of digesting its content too. Forced to reduce an opinion to a binary assessment, “Us” unquestionably qualifies as “good.” At times excellent, “Us” at the very least is an entertaining, recommendable film. Rod Serling would grinningly nod in approval over its status as a feature-length take on “Twilight Zone’s” template. “Us” possesses timeless social context, smart writing, superb acting, and a twisty tale that terrifies while taking place in an askew yet frighteningly relatable reality. Still, overeager swooners putting backs of hands to fainting foreheads while proclaiming “masterpiece” could stand to dial down the hyperventilating hyperbole by two or three notches. Peele’s story of underground-dwelling doppelgangers keeping up with the Joneses by killing them in a nightmarish nationwide revolt is chock full of ideas. However, some of those ideas are unapologetic about their Saturday matinee silliness. Awarding all of them merit above mere monster movie madness would be misguided at best and foolhardy at worst. Naturally of course, “Us” isn’t set up to be accepted as starkly serious, which is why it would be ill-advised to get hung up on head-scratching conundrums. Not unexpectedly in light of his background, Jordan Peele expertly injects comedy at opportune moments. Occasional jokes put “Us” in a pleasing place where its “unrealness” doesn’t read as too phony while permitting the Wilson Family to remain endearing. This is a dark fairy tale, vaguely EC Comics-ish in conception, and Peele wants it to appear accessibly four-color in texture. A little laughter goes a long way in a fright film though. Having Tim Heidecker ham it up in dual roles, especially in one meant to be murderously menacing, saps too much of the scare factor. Even with his sure hand, Peele is prone to indulgent performances that aren’t always best for maintaining mood. March 29, 2019 by Ian Sedensky.